Weeks ahead of Apple's official Apple Watch launch date, a number of photos hit the Web on Tuesday allegedly revealing the device's packaging, as well as a first look at accesosry wrist bands. 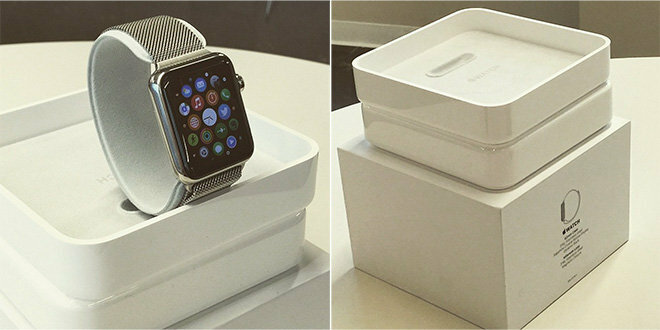 Posted to Instagram by user Jeremy Gan, who apparently works for The Daily Mail, the photoset shows what is claimed to be retail packaging for a 42mm stainless steel Apple Watch with Milanese loop band. Another photo purportedly reveals Apple's leather band with modern buckle. 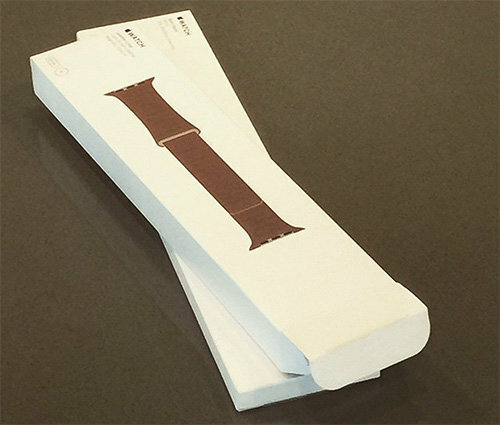 If genuine, the photos prove Apple is treating Apple Watch in much the same way as traditional watchmakers package their wares, supplied in a felt presentation box with included retaining ring stand. Keeping in line with other Apple device offerings, however, Apple Watch packaging looks to be made of polycarbonate. Commenting on the product itself, Gan says Apple Watch feels and works better than expected. As for band choices, Gan prefers the look and feel of stainless steel over the leather version. Apple Watch preorders kick off on Friday at midnight Pacific, with the device scheduled for release on April 24. A memo from Apple retail chief Angela Ahrendts leaked earlier today called on Apple Store employees to direct customers interested in purchasing Watch to the Online Apple Store, perhaps buffering against low in-store supply.